All Tools, developed by dreamscene.org, are completely free for personal and commercial use. All Downloads 100% spyware/adware and virus free. XPScene: Use XPScene to run all videos from dreamscene.org as desktop background on your Windows XP system (read more). Softpedia guarantees that XPScene 1.2.8.317 is 100% CLEAN, which means it does not contain any form of malware, including spyware, viruses, trojans and backdoors. Screen2Dream: Use Screen2Dream to run your favourite Screensaver as desktop background on Windows XP and Windows Vista (read more). Softpedia guarantees that Screen2Dream 1.0.8.416 is 100% CLEAN, which means it does not contain any form of malware, including spyware, viruses, trojans and backdoors. 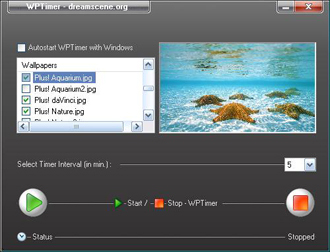 WPTimer: Use WPTimer to change your desktop wallpapers automatically at a specific time interval on Windows XP and Windows Vista (read more). Softpedia guarantees that WPTimer 1.0.8.1128 is 100% CLEAN, which means it does not contain any form of malware, including spyware, viruses, trojans and backdoors. XPScene generates a html-file, specially customized for your PC, with an embedded windows media player control playing your DreamScene video (so no additional software is required). You can select the html-file like any other wallpaper (like .jpg or .bmp) over "Display Properties > Desktop > Background > Browse". 1. select input video (*.wmv, *.mpg or *.avi) and select Resize Mode: Use "stretch" to avoid black bars, or "keep aspect ratio" for best quality (default, recommended). Now you can select your DreamScene html-file by clicking "Display Properties > Desktop > Background > Browse". The XPScene tool needs the Microsoft .NET 2.0 Framework to run correctly. 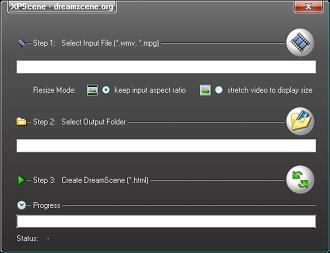 XPScene is only needed to create the DreamScene html-file, it is not needed to run the created DreamScene file as video background. To smoothly run DreamScene videos on Windows XP a 3.0 GHz single core CPU (or better) and 1024 MB Ram (or more) is recommended. In addition, a graphics card with DirectX hardware video acceleration can dramatically reduce cpu usage (all newer NVIDIA and ATI cards). 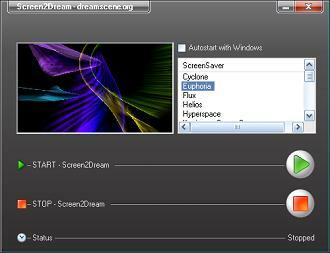 Play your DreamScene video with your Windows Media Player. This should work in all cases. Try to open the html-file created by XPScene with Internet Explorer (not e.g. Firefox or Opera), to install the latest media player plug-ins for IE. Do not move the created DreamScene folder to another location, this will break the html-code. Use Screen2Dream to run your favourite Screensaver as desktop background on Windows XP and Windows Vista. 1. select your favourite Screensaver in the List Box. 3. click STOP to disable Screen2Dream and to return to normal desktop mode. You can select your desktop shortcuts over the system tray menu while Screen2Dream is running. The Screen2Dream tool needs the Microsoft .NET 2.0 Framework to run correctly. The desktop behaviour can depend on the selected Screensaver. If you encounter some problems while using Screen2Dream, try to select a different Screensaver. Use WPTimer to automatically change your desktop wallpapers at a specified time interval on Windows XP or Windows Vista. 3. click the "Start" button ... click "Stop" to return to normal desktop mode. You can minimize WPTimer to the system tray while running (double click to show WPTimer again). WPTimer needs the Microsoft .NET 2.0 Framework to run correctly.